14 Sep 2018 --- Nestlé is stepping up its game when it comes to no deforestation commitments by becoming the first food company to use a high-tech satellite-based service to monitor its palm oil supply chains. In a bid to distance itself from the controversy associated with deforestation and hit its 2020 no-deforestation targets, Nestlé has implemented Starling, a global verification system using cutting-edge technology combining high-resolution radar and optical satellite imagery to provide constant unbiased monitoring of land cover changes and forest cover disturbances. Hailed as a game-changer in transparency, the satellite monitoring verification system has been piloted in landscapes in Malaysia and is ready to be rolled out across Nestlé’s palm oil supply chain by the end of this year. The system will track changes on the ground, monitoring palm oil plantations for signs of deforestation. It collects data and analysis to allow companies to manage risks and perform field intervention strategies to drive changes. Operating as an “eye in the sky” 24/7 monitoring system, Nestlé can track what is happening on the ground in precise detail and will be alerted to any problems. It says that any non-compliant suppliers will be suspended. Starling was developed by an international pioneer in the aerospace industry Airbus and The Forest Trust (TFT) – which helps businesses bring responsible products to market – as a global verification system evidencing that no deforestation is taking place throughout the supply chain. Starling is a fully digital service, offering best-in-class machine learning and cloud technologies to provide very precise and near-real-time forest cover change information, according to François Lombard, Head of the Intelligence Business at Airbus Defence and Space. It’s a significant step forward in the fight against the devastating impact deforestation has had as a result of the growing demand for palm oil. Deforestation is a serious and complex issue and addressing it requires the entire industry working together towards greater transparency, inclusiveness, direct supply chain engagement and capacity building throughout the supply chain, says Nestlé. “Nestlé has always been committed to source the raw materials we need to make our products responsibly. In 2010, we made a No Deforestation commitment stating that all our products globally will not be associated with deforestation by 2020,” said Magdi Batato, Executive Vice President, Head of Operations, Nestlé SA. By 2017, 63 percent of Nestlé global supply chain was deforestation-free. “To accelerate this journey, we have worked with Airbus and TFT since mid-2016 to embark on a pilot project over the Perak landscape in Malaysia. Starling satellite monitoring is a game-changer to achieve transparency in our supply chain and we are pleased to extend this collaboration to cover 100 percent of Nestlé's global palm oil supply chains by the end of the year,” he adds. The satellite program will also be extended to cover Nestlé's pulp and paper supply chains next year as well as soya at a later stage. “Terabytes of satellite images are turned into actionable information, to provide our customers with a reliable service to monitor their supply chains and to early identify potential deforestation events,” he says. Starling utilizes Airbus's high-resolution SPOT 6 and SPOT 7 satellites as well as third-party sensors, which are designed for large geographical areas. With sharp accuracy and detailed resolution, Starling's reference maps differentiate between production forests that include palm plantations, protected forests and other regions. “We welcome Nestlé's commitment to using Starling to monitor 100 percent of its palm oil supply chain,” says Bastien Sachet, CEO, TFT. Earlier this year, Nestlé committed to achieving 100 percent RSPO certified sustainable palm oil by 2023 and by this December 100 percent of Nestlé's palm oil supply chain, approved or not, will be monitored for deforestation using satellite imagery. To further increase transparency, Nestlé has made available the names of the direct suppliers and mills that it buys palm oil from. 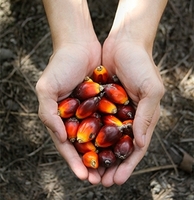 This covers 91 percent of the total volume of palm oil Nestlé sources annually. “This information along with our progress reports will be shared with our stakeholders, including consumers, investors and retailers. They will be made available in our Transparency Dashboard to be published on our website by March 1, 2019,” explains Benjamin Ware, Global Head of Responsible Sourcing, Nestlé S.A.
Palm oil, how it is sourced, where it comes from and third-party suppliers in grower countries have been heavily scrutinized in recent years as industry steps up efforts to clean up the supply chain. There is also significant pressure from non-government organizations and environmental groups like Greenpeace which continually investigate the palm oil supply chain. Increasing consumer awareness about the major issues of palm oil has led to many companies committing to only using “deforestation-free” palm oil products – those made exclusively using palm oil from plantations that have not cleared forests. In May, a study from the Imperial College London examined the challenges of “deforestation-free” palm oil claiming that achieving this is not as simple as it sounds. Researchers say a better approach is needed that goes beyond the public shaming of companies in the supply chain and that genuinely “deforestation-free” palm oil products are problematic to guarantee. Palm Oil Nestlé Deforestation Airbus The Forest Trust (TFT) Transparency Satellite Roundtable On Sustainable Palm Oil Starling.